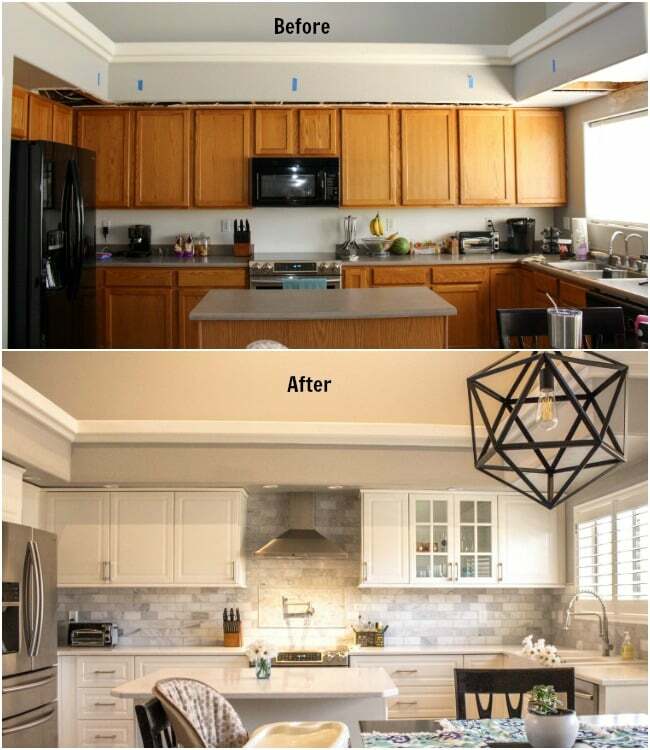 This post has been a long time coming and I’m so happy to finally share our completed kitchen remodel! 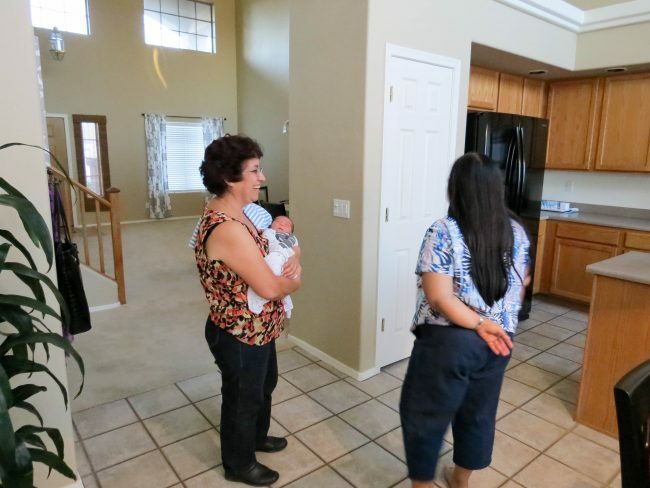 We purchased our home in October of 2011, and while it had good bones, the interior was dated. Our first renovation was in June 2014, where we completed all new flooring in the entire house. This was a huge improvement from the old carpet and dated tile. We waited a few years to save some money and made a plan the beginning of 2017 to complete more renovations. 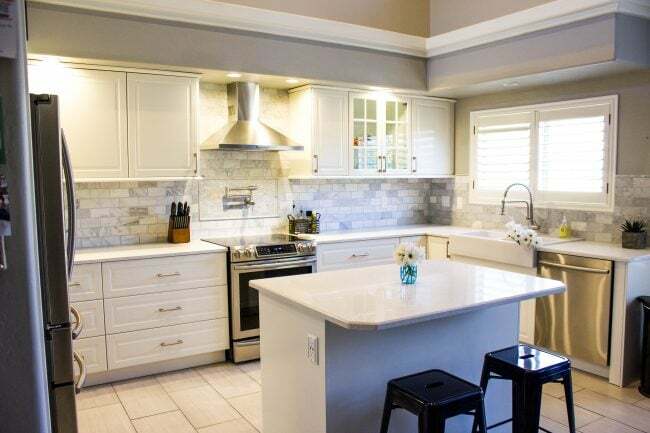 Our priority list included, having the house painted on the exterior and interior, new window shutters, replacing all of our gold hardware, new lighting fixtures, and the most expensive one- renovating our kitchen. 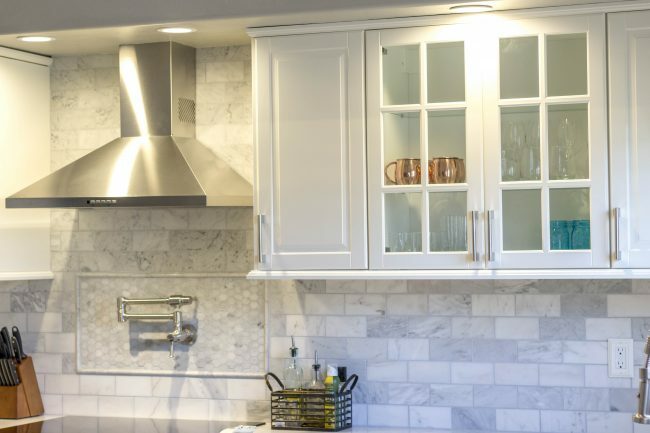 We knew that kitchen renovations were expensive and we had an idea of our ‘dream kitchen’, but we wanted to make the most of the money we had to spend. 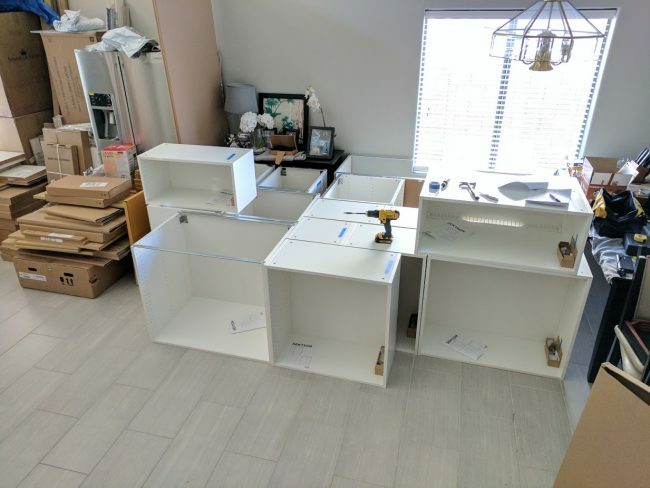 After pricing out some options, we chose to go with an IKEA kitchen, and drumroll….Do it ourselves! Yep, after getting a quote from IKEA for installation, we decided that we could save that money and splurge on high-end appliances. We also saved 20% since we bought the kitchen during their Kitchen Sales Event. I highly recommend waiting for this sales event if you want an IKEA kitchen. 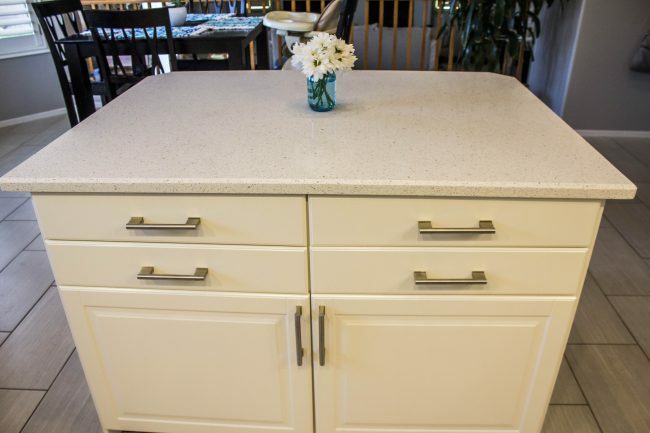 The 20% also applies to the countertop and we went with a white quartz countertop. Danny is very handy, but I was still unsure how we were really going to pull this off. After watching several YouTube videos of DIY IKEA kitchens, we went for it, actually Danny did and I was his helper. It took about 3 weeks for the kitchen parts to arrive and that’s when reality set in, hundreds of pieces and boxes arrived on our driveway in 2 large rectangular pallets. I think Danny and I both had mini heart attacks after this! Once we got over the initial shock, it was go time. 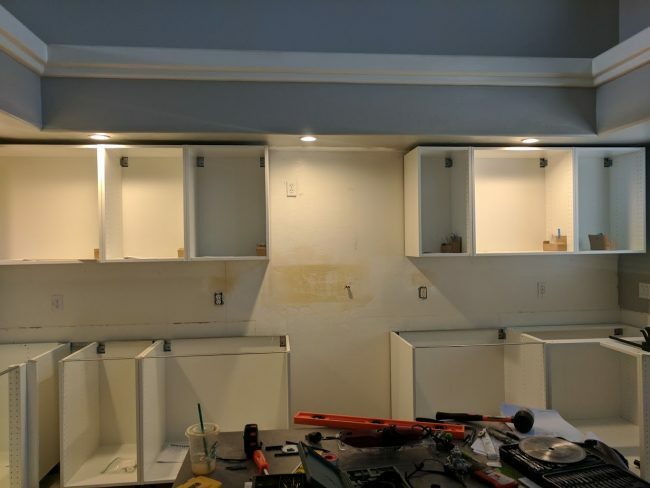 We started by removing our recessed lighting and relocating them, since the new cabinets are longer in length. The drywall needed to be repaired and after 2 failed attempts, Danny hired a drywall expert to come repair it. Then we started removing the top cabinets and completing new plumbing for a pot filler over the stove. This wasn’t in the initial plan, but a splurge we were able to squeeze in. The instructions for the IKEA kitchen is modular and actually made it easier to install. Basically you put together each cabinet and a master blueprint shows where each piece would go. The assembly of the cabinets themselves were not difficult, pretty much your basic IKEA furniture assembly. However, the installation of the railing, where the cabinets hang, was a little challenging. 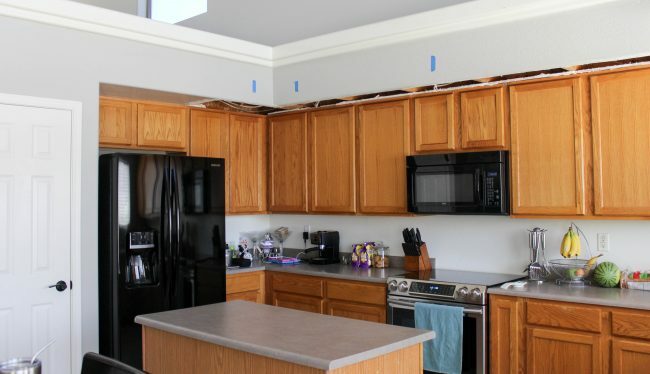 But once the railing was secured and strait, it was just a matter of hanging up the cabinets. Another challenging part was cutting the pieces of wood for the outside of the cabinets. This took some saw skills, and Danny ended up buying 3 different saws to complete all the different wood cuts needed. Now we have every type of saw lol. 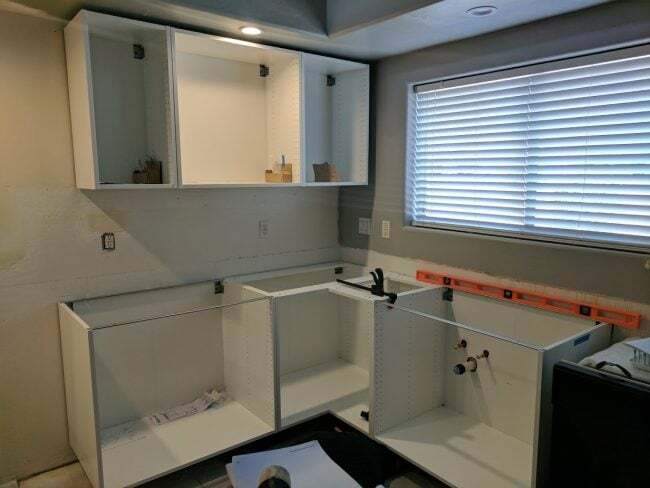 Once the cabinets were all installed, we were able to call the countertop company to come measure. It took 2 weeks for the coutertops to be fabricated, and once they came to install them, 2 of the pieces were the wrong size. We were frustrated, but luckily it was just an issue of the wrong pieces getting picked up and the right ones were at the factory. They were able to finish the install that day, and we loved the way they looked! We also had the island extended 1 foot to have room for seating. We were finally seeing the light at the end of the tunnel, and lots of blood, sweat, and tears, in the process! About 90% of the kitchen was completed and the next step was to order all new shutters for the windows. These took 8 weeks to deliver and caused a delay in our kitchen completion. Since the shutters had a border around the window, we needed to wait till they were installed before completing the backsplash. 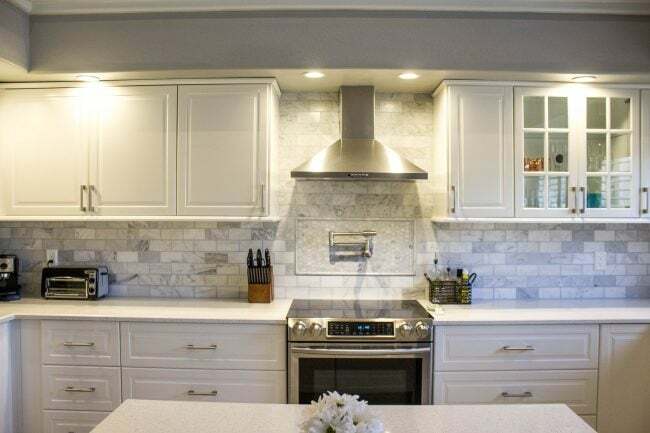 Initially we were going to do a white glass subway tile, but once the cabinets and countertop were installed, I felt the white would be too plain. Then we saw a carrera marble subway tile, and instantly fell in love. 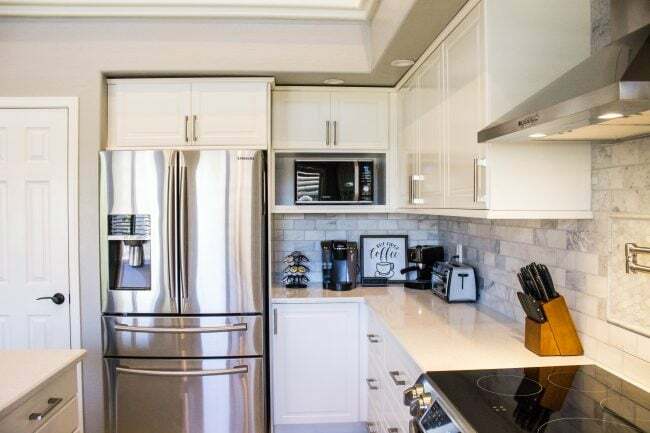 Each piece was different and had various shades of white and grey, which was perfect for adding color and texture to the kitchen. I absolutely love the way it turned out, and the fact that my husband built it makes it that much more special. 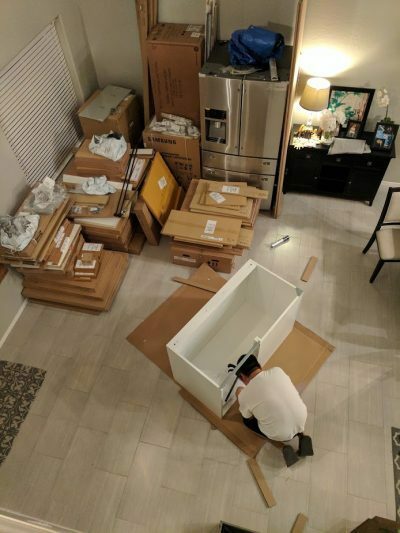 The white farmhouse style sink is from IKEA and the faucet we ordered from Amazon. 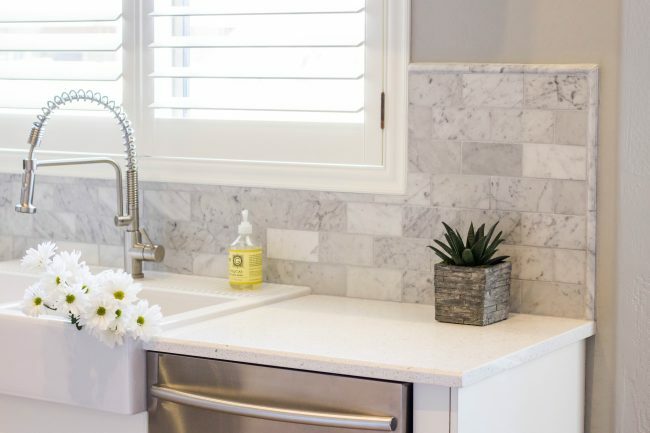 I love the way the marble tile gives some pattern while still going with the theme of our white kitchen. We choose two glass doors as accent doors to showcase drink ware. The last minute decision for a pot filler was the best decision. I love the high-end look and it’s so nice to fill pots for soup or to boil pasta. 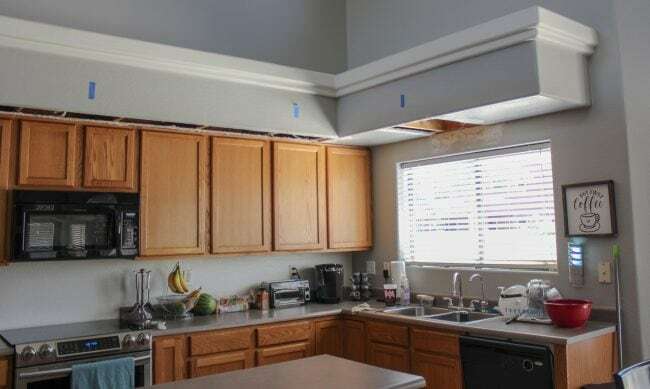 Our old layout had the microwave above the stove, but we wanted a functioning hood and created a hole in the wall for a ventilation system. The microwave needed a new home, so we designed an open cabinet and purchased a smaller counter microwave that fits in the cabinet. 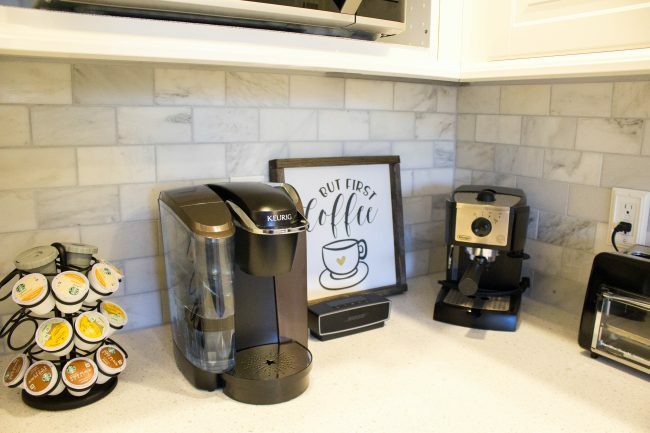 My Husband and I are both coffee addicts, so a pretty and functioning coffee bar was a must! 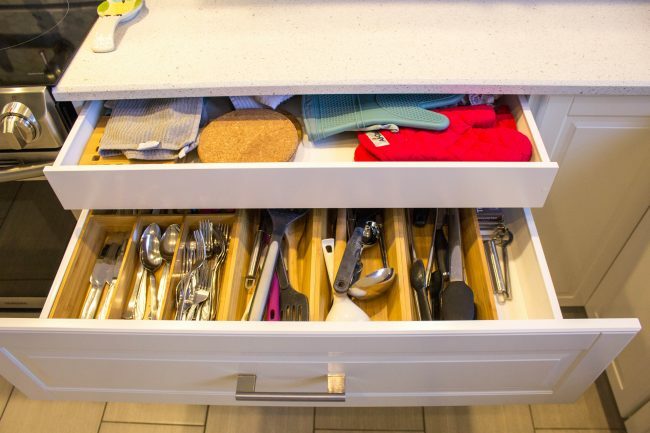 Not only did we create more space with this layout, but the IKEA drawer system is perfect for organizing and storing kitchen items where they can be easily accessible. We also added hidden drawers to the top for smaller items to be stored. With the extended island we have more seating and the kids love that they get to sit and help me with food prepping or just watch me cook. To see the before and after picture is a dream come true. It was not an easy project to complete, and thankfully with the patience and dedication of my husband we were able to do it. Memories are made in the kitchen, and I love that I get to make special memories here! This look amazing! Congrats on your new kitchen, it turned out wonderful! This kitchen is now MUY CALIENTE! Thank you for not putting the microwave above your range but tucking it off to the corner and mostly out of site – very wise. You guys did an awesome job, Danny is now allowed to drink beer on the couch as often as he wants. How much would you think the whole excersize cost? You kind’a inspired me to do our renovation myself! Hi Salma! I will preface by saying it was not an ‘easy’ project, but depending on your skill level it’s most definitely do able! All the cabinets and quartz counter top was a little over $10k but that’s with the Ikea 20% off sale. To have them install it would have been another $5-6k. So we definitely saved a lot doing it ourselves.